Editor’s Note: This article is courtesy of the team at Art’s Cyclery and was written by Scotty Ender. The original post can be found here. Though the Continental Der Baron Projekt wasn’t my favorite tire to date for dry, skatey, rocky terrain, this tire would almost surely shine in wet and/or loamy terrain. 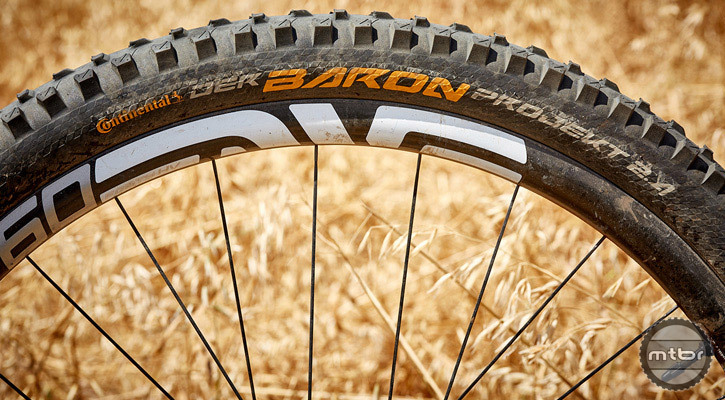 Plus, the Der Baron’s casing is super durable, resisting tears and punctures in even the sharpest rocks. Here’s the tire’s basic beta. Read the full review below to learn more. Weight: 29×2.4” Pro Apex is 953 grams. Width: On 21mm inner rim width casing is 2.13”, while tread is 2.27″. TPI: 60. Compound: Black Chili for increased grip, tread life, and decreased rolling resistance. Protection: Apex Sidewall increases cut resistance. Made in Germany. When I arrived to this area nine years ago, I quickly realized that San Luis Obispo, California, is an interesting place for mountain bikers to live. With an abundance of sharp rocks and complete lack of “flow,” hardtails and thin tire casings are virtually impossible to find because they simply won’t hold up on our best trails. Thus, I’ve become comfortable riding 900+ gram tires that don’t roll very well, with the trade off being usable traction in rough terrain. On first inspection, the Continental Der Baron Projekt looked like one of those tires that would handle demanding terrain capably. But how would they hold up out on the trail? When I was still running 26″ tires, I loved Continental’s Trail King tires not only for their uncanny ability to hold onto dramatically varied terrain, but also for their massive 2.4″ super high-volume casing. Compared to the latest crop of modern tires optimized for wide rims, Continental’s Der Baron 2.4 tires on 27mm internal width rims looks skinny. Running 29 psi in front and 31 psi out back, the casing left me wanting more. Though the casing didn’t rip or tear during the test, it did collapse enough to “pang” my ENVE M60 HV wheels against rocks on several occasions. Another qualm that I had with the casing was that it felt really “bouncy.” The fast-rebound rubber made the casing seem to jump from rock to rock, which made holding a line more difficult in rocky terrain. For a tire with such an aggressive tread, a higher volume casing and a slower rebound rubber would be ideal. For the duration of this test, these tires held up incredibly well to SLO’s unforgiving terrain. Drops onto sharp rocks and turns littered with baseball-sized pebbles couldn’t break through the Apex Sidewall Protection casing. Although I have my complaints about the casing’s structure and rubber compound, running a tire that resisted tears gave me the confidence to ride unfettered and certainly bumped the tire up a couple ticks in the points standings. 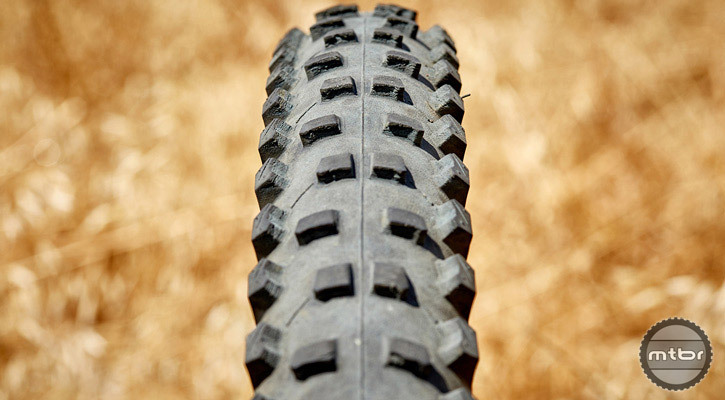 This tire’s tread pattern falls somewhere between a mud spike and an aggressive all mountain tire. It didn’t perfectly mesh with the overly rocky terrain of San Luis Obispo, seeming to be better suited towards deep loam, softer dirt, and potentially wet conditions. That being said, they still performed really well and inspired confidence in loose conditions. Any breakaway or loss of traction that I encountered was predictable, meaning that it never caught me off guard. Even in the loose stuff, after breaking free, the knobs eventually found purchase and I was able to bring it all back together safely. In the few places where I encountered hardpack, the tires were a bit slow and unwieldy, but this was to be expected. If you frequent wet terrain, deep loam, or super fluffy dirt (U.K. and B.C. 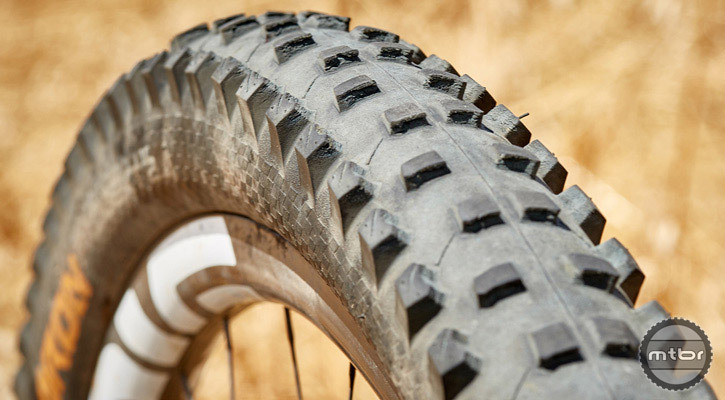 readers take note), then you’ll be hard pressed to find a better all-around tire for your trail, all mountain, or enduro bike. Though the casing wasn’t my favorite, it was acceptable for a tire that never left me stranded. For more information please visit www.artscyclery.com. For context, what is your favorite tire? And what do you love about it?